Muggles from around the Boston area hit the streets in honor of the release of "Harry Potter and the Deathly Hallows," J.K. Rowling's final installment about the boy wizard. 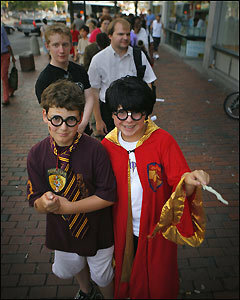 Here, Sean Englert and Daniel Wilson donned their wizardly best as they waited in line at the Harvard Coop. Did you participate in Pottermania?